When we left hotel for Istanbul we forgot in the room our daughter's smartphone. One day after, we called and they said they've found it. They sent that by mail next day to Istanbul. Very honest by them. Our room had very nice view, food was good. In total worth for the money we paid. Special thanks to the office manager for help mentioned above. The pool is so fab and the location is perfect, you should go on their website to view the pictures of the pool because they are exactly how it is in real life . The staff were very quick if I ordered drinks or toilet roll to the room and were always very polite and friendly. Location. And the female at the front desk who works during the day helped us out a lot. breakfast was good with variety for children. Staff were really helpful. Only a 5 minute walk to kusadasi town. went in winter, so couldn't use all the amenities. A lovely hotel ,great location,great sea views ,extremely clean ,wonderful helpful staff ,particularly Nurzen guest relations manager,room cleaned everyday,pool area spotless ,cleaned and maintained everyday.Dolmus [local bus directly outside hotel to town ,very cheap ] and very frequent.great location also can easily walk into town . View from our balcony was amazing! Hotel close to sight-seeing places. Beautiful well decorated hotel.Rooms are big and elegantly furnished.Breafast was sumptuous with Verity of dishes.Eser and Nimet were wonderful ladies on front desk.They were curtious and helpful. not cleaning every day. they did clean 3/6 days. no parking. and very rude when using restaurant parking. Marina Hotel & Suites Kusadasi This rating is a reflection of how the property compares to the industry standard when it comes to price, facilities and services available. It's based on a self-evaluation by the property. Use this rating to help choose your stay! Marina Hotel Kusadasi hotel offers an outdoor pool and a terrace with panoramic views of the sea and Kusadasi Marina. The public beach is only 1,650 feet away. The air-conditioned rooms of Marina Hotel Kusadasi include a mini-bar and an LCD TV with satellite channels. They all have a private balcony with sea or garden views. Free Wi-Fi is also available in the rooms. 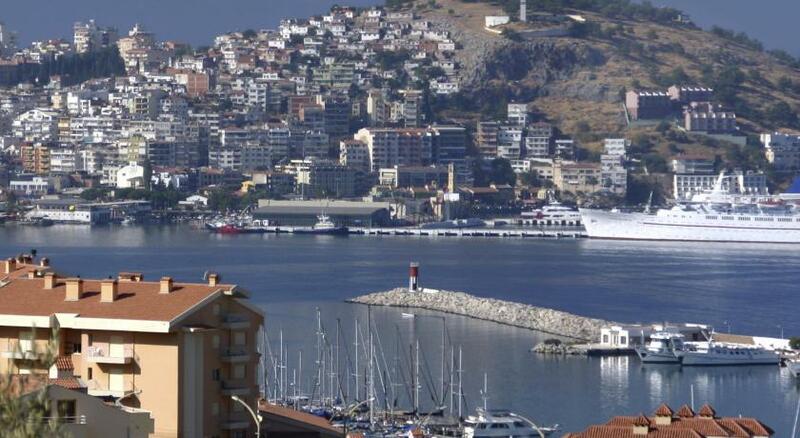 Kusadasi city center is just 0.6 mi from Marina Hotel with numerous restaurants, bars and shops. Izmir Adnan Menderes Airport is 43 mi away. This is our guests' favorite part of Kuşadası, according to independent reviews. When would you like to stay at Marina Hotel & Suites Kusadasi? This air-conditioned room offers a balcony with garden or sea views. This suite has sea and garden views. This spacious room offers a private bathroom with a bath. This family room has satellite TV, air conditioning and mini-bar. House Rules Marina Hotel & Suites Kusadasi takes special requests – add in the next step! Marina Hotel &amp; Suites Kusadasi accepts these cards and reserves the right to temporarily hold an amount prior to arrival. Marina Hotel & Suites Kusadasi accepts these cards and reserves the right to temporarily hold an amount prior to arrival. Please note that Marina Hotel Kusadasi will organize a New Year Dinner. The schedule includes live music, unlimited alcoholic and nonalcoholic drinks and night soup. Child care is available for kids. The property also provides a rich brunch for the following day. Bringing food and beverage from outside in not allowed. Please note that cleaning, dry cleaning, ironing and laundry services are offered at an extra fee and are available between 11:00 - 16:00. When booking, please use each guest name and surname staying at the property to submit the reservation. The hotel facilities are very bad. We were not given the room which we booked online and it was totally different room. There was no Iron and Kettle in the room and on asking it from reception they said they don't give it and were not willing to facilitate on that. I was travelling with kids and needed the kettle. I have never seen a hotel where they don't give such basic facilities. I had a very bad experience staying in this hotel. We were a group of 14. One of us left earlier than the rest, so a triple room became a double room for the last 2 nights. Even though we paid all for this triple and for the future double at the check-out of the person that left earlier, at the final check-out they requested to pay again for the double room. We had to insist and even say that, as we already paid, we will call the police to check the video cameras at the reception. After some 'checking', they said that it was a mistake and that we only have to pay around 20 euro, not very sure what for, but we paid so that we can go, as we were already very late...plus, the staff's very poor english, with only 2 exceptions (including the manager, who was indeed nice and helpful). The running hours of the swimming pool - 10 A.M. - 6 or 7 P.M. The rooms - we had 2 triples and 2 family rooms for four - even if the price for the triples was the same, one was bigger and nicer than the other one; as for the family rooms, they were not so nice, with mostly old furniture and dirty walls and bathrooms. no parking. not cleaning every day. old carpets. average food. besides the view the hotel has nothing good. i would not stay there again. I have chosen a room for three adults, but it was just for two, they have only added one more bed. (not bed, even cot) internet connection was poor. Place was good, personal normal, hotel has very beautiful pool, breakfast was great, rooms were clean recommended place.